Imagine yourself the night before you embark on a cruise. Perhaps you”re unwinding in a cozy hotel room, sipping on a glass of wine and listening to the song of the ocean. Or maybe you’re at a fine restaurant enjoying a delicious meal before you head back to your hotel room to rest up. A relaxing hotel stay the night before your cruise can get you in the mood for your trip and give you a head start on your vacation. For passengers embarking from Port Everglades, hotels in Fort Lauderdale and the surrounding area offer great deals and services. Every room at B Ocean boasts an ocean view, though you’ll see plenty of the ocean on your cruise, so it’s a good thing that the offers discounted room rates to residents. B Ocean offers several deals that go beyond those that cater to cruise-goers, so it could make a sweet place to stay on your return trips to the area (or if you want to extend your vacation after you get back from your cruise). This place gives you everything you need to get your vacation off to a fantastic start. Free transportation to the port, free Wi-Fi, and 10% off room rates are all noteworthy perks at the Days Inn Bahia Cabana Beach Resort and Marina. Try some cocktails and a yummy meal at the World Famous Patio Bar/Restaurant, which offers free entertainment every night. Forgot to pack your swimsuit? No worries. A quick visit to the gift shop will take care of any essential you may have forgotten to pack. The Hilton Garden Inn is a nice place to rest before you”re on your way to your ocean adventure. Their cruise package includes complimentary transportation to and from Port Everglades. While you’re sailing away, there is no need to fret about your car, since the package also includes parking. Start your embarkation day right with a stop at their all-you-can-eat breakfast buffet. Their website says that “If you’re looking for the perfect kick start to your Fort Lauderdale cruise experience,” this is the hotel to book a room in. Their Cruise and Snooze package will spoil you with a welcome drink when you arrive, a nice breakfast in the morning, and a ride to the port. Plus, depending on availability, they might give you a complimentary upgrade to view rooms when you check in. However, this isn’t fly-cruise-and-snooze package, so if you”re flying in to a nearby airport, you’ll need to make your own arrangements for getting to the hotel. Why not get in vacation mode from the moment you step out of your house? 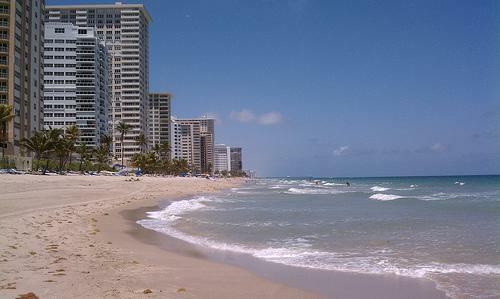 A stay at the Ritz Carlton in Fort Lauderdale will help you do just that. The design of the hotel itself reflects the over-the-top styling of ocean liners from the 1940s, getting you in the perfect frame of mind for your For example, if you made 1,000 blackjack online bets at $5 a piece with a 2. upcoming voyage. Every room offers a water view and a balcony from which to enjoy it. The hotel is also home to a spectacular Wine Room and the only luxury spa in Fort Lauderdale. Their Bon Voyage package provides you transportation to and from the airport and the cruise port. Not convinced yet? Ritz Carlton hotels give some of the best customer service in the nation, so if getting spoiled is the aim of your getaway, this is the place to stay. If you’re all about location, location, location, consider the Crowne Plaza. It is practically next door to Port Everglades, and resides within a mile of the airport. The hotel itself gas limited perks, but its convenient location makes it perfect if you”re looking for a nice place to rest up before you hit the ocean. It’s also nice if you have any last-minute business to do, since the hotel features a business center and offers courier and facsimile services. Vacations costs add up quickly. If you’re looking to stretch your budget, take a look at the Fairfield Inn and Suites in Dania Beach. Here you”ll find a comfy place to stay with reasonable room rates. Their cruise package includes parking at the hotel for up to three weeks without having to pay an extra fee and a complimentary shuttle ride to the port. Love that new building feel and smell? Look no further than the new Cambria Suites in Dania Beach. This hotel boasts with a well-equipped fitness center, gourmet coffee bar and a bistro that serves breakfast and dinner. Their parking offer will house your car for up to 31 days. If you’re looking for what they call “a personal environment with all the contemporary flair and sophisticated technology of a modern home,” for the night before your cruise, definitely put this hotel on your list of maybes. The Gallery One (which belongs to the Hilton family of hotels) in Fort Lauderdale offers reasonable room rates along with some standard amenities. Transportation to Port Everglades is available between 11am and 2pm, and the pre-cruise package only covers the ride for two people, with extra riders costing about $8 each. It isn’t the most inclusive of all pre-cruise deals, but it”s convenient and covers the basics. You don’t have to wait until your cruise ship leaves port to start relaxing on your well-deserved getaway. Many hotels in the Fort Lauderdale area offer special deals that cater to cruise travelers, the above being just a handful of good examples. You can browse sites such as TripAdvisor.com and Hotels.com for further ideas on getting your vacation off to the right start. Bon voyage!